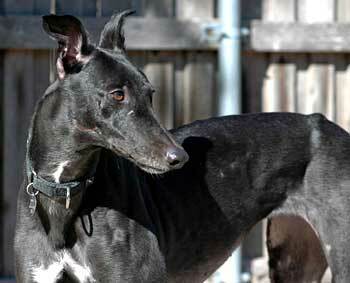 Ginny, aka TN's Gina, is a 5½-year-old, lovely small black female born April 1, 2001. Ginny's sire is TN's All Star and her dam is Pinup Girl. Ginny's racing career consists of 13 races, all held at the Mobile, AL track between December 3, 2003 and November 4, 2004. 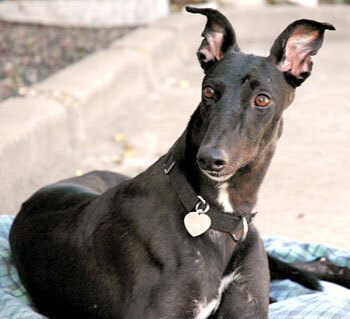 Prior to her arrival into the GALT family, Ginny had the misfortune of falling from a moving vehicle and she has some significant scarring as a result of the accident. Ginny also has corns on her front paws that slow her down a bit, primarily when she has to walk on rough surfaces. 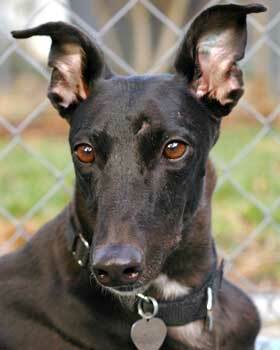 Ginny is in search of a lifelong companion who will see past the scars and realize what a jewel she truly is. With careful supervision, Ginny could be cat trainable and she passed her small dog test in the company of two 17-lb canines. Ginny has been in my home since early October. If you frequent the GALT website, you might have read her earlier write up and were quite possibly left with the impression that Ginny is lame. Not! OK, so she may not be breaking any speed or distance records, but Ginny and I are happy to report that our routine now includes a 15-20 minute (depending on how much sniffing is allowed) daily walk. Nobody is happier about it than Miss Ginny-Binny. The perfect candidate for a leisurely stroll, Ginny prances along like she is in a parade. Ears up and always on the lookout for a human to scratch them, Ginny walks the 'hood' like she owns it. Squirrels beware, because Ginny will let you know she sees you. Watch that nose as she sniffs the breeze, no telling who previously walked her turf. A more genteel lady could never have presided so graciously. The only thing missing is the crown. As mentioned above, Ginny has some corns on her front paws. When asked why they can't be removed, I have to tell people, "Well, yes they can, but corns come back." Corns occur as a result of bone rubbing against the pads of the feet, and there isn't much that can be done about that. When Ginny arrived 4 months ago, she was hobbling. With diligent nail trimming and balm for her pads, the difference is truly remarkable. Just ask Ginny-Binny, because she likes to have her say on important matters. Yes, Ginny does have a voice when she gets excited, but otherwise she is as quiet as a church mouse. My own dogs gallop down the hallway when they play; Miss G flutters like a butterfly as she follows. A dedicated snoozer, Ginny is hard to find in the house unless you know her usual haunts. Showing a keen interest in sofas when she first arrived, Ginny had to learn that canines are not allowed on the furniture here. She has succumbed to this 'mistreatment' and has resigned herself to slumbering on dog beds. However, should you feel differently about dogs on the couch, my house rules will easily become a distant memory for Ginny-Binny. I love this dog. What more can I say? 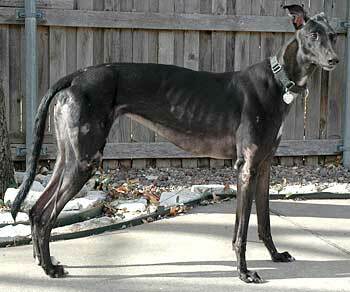 Ginny's scars are only on the surface; her gentle soul is a reminder of what greyhounds are all about. She has had a run of bad luck and it's time for the tables to turn in her favor. Ginny Binny is my little treasure, and the two of us are patiently waiting for that special someone who will discover our secret. Behind every Greyt team of atheletes, there always exists the support staff. You can see the GALT cheerleaders on the website, you'll read about the athletes themselves, and now you get to meet their coach, Ginny. Miss Ginny Binny, to those who know her well, started her career as a racer but after retiring early from the Mobile track, Ginny's life took her in another direction. A case of corns on her front feet has knocked considerable time off Ginny's pace, so she is now working from the sidelines. Nothing pleases Ginny more than taking a seat next to my chair in the backyard while she coaches my other greyhounds in the art of chasing squirrels. Like a baseball catcher giving hand signals to the pitcher, Ginny's ears point towards the squirrels and she eagerly watches the team as they charge off in mad pursuit. Every now and then Ginny-Binny gets a wild hair herself, and although she does her very best to follow, she returns to the bleachers after a brief stint as she does not move very quickly. Never one to complain, Ginny re-adjusts herself in her seat and turns her attention back to the chase. A true coach at heart, Ginny know how to boost the team's morale. She is not one to cross words with the other dogs and is very considerate about respecting her rank. The team, in turn, thinks she is a champ and oftentimes I'll catch a glimpse of Ginny touching noses as she offers her support. When Ginny isn't busy coaching, she likes to look for a comfy dog bed inside. Hands down, Ginny is the perfect house guest. She does not counter surf, there have been no potty accidents and she doesn't have any interest in shoes. Ginny likes toys, but plays gently and doesn't resist if one of the other players take them away from her. She needs a push to go into the crate, but settles down and doesn't complain once she is in. Ginny has now been in my house for several weeks, so I have started leaving her uncrated when I am gone for a few hours. There have been no incidents and I am only met with stifled yawns when I get home. Ginny is a quiet girl and would be the perfect companion for someone looking for a low-key dog, one that really can't go for long walks but is still a top notch companion. She would be perfectly content in an apartment, ground floor please, as she doesn't do well with stairs. One would think Ginny has had her fair share with the corns, but as luck would have it, this lady was dealt another bad hand when she had the misfortune of falling out of a moving truck. Talk about being in the wrong place at the wrong time! Ginny has some scars on her right side and some chipped teeth, but that doesn't hold her back for a New York, 'er Dallas, moment. When she looks in the mirror in the morning, Ginny knows she is still a knockout. 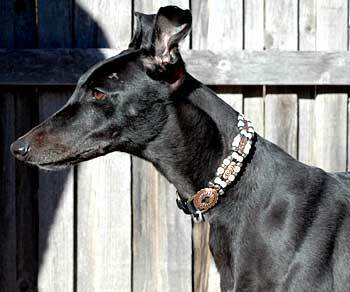 She has the classic greyhound build, a sleek black coat, beautiful eyes, and a soul to match. Ginny is one beautiful girl. Every graduating class has their "most popular" or their "most likely to succeed". When Ginny graduated from the Mobile track, she was undoubtedly dubbed "most likely to steal your heart." She has certainly stolen mine.